I’ve been struggling with a couple of long(ish) distance races recently, and still finding it difficult with the enthusiasm to get myself out often enough and long enough on training runs. I’ve decided that the best course of action over the long winter is enter 10 mile plus road races as often as possible to make myself get out. At the same time, I’ve recently started following Trawden AC on Twitter. A combination of these two came together last Sunday as TAC retweeted a 10-mile race that Preston Harriers were organising. A quick look at the website, and it turned out the race was £16 including a t-shirt, which sounded a bargain. Relatively local, so I thought there’d be a few familiar faces on show. Quick arrangements made with my ever obliging wife, and I was signed up. Less than a week later I found myself on the way to the suburbs of Preston for a 10-mile race. I’d mentioned on the Friday TAC facebook page that I was going and offered a lift to any fellow humbugs. No one took me up on the offer, and there was no mention of anyone else heading over to that ‘superior’ area of Lancashire (it’s really not, there must be something about fans of teams that wear white and their delusions of grandeur). It seemed most humbugs were mud-lovers for this weekend, and some really bonkers sorts were after both mud and climbing Pendle more times in a few hours than I have in my whole life. Special well done to all those folks. The race whilst named Preston 10 Mile Road Race, didn’t feel much like Preston. The race HQ was at Hutton Grammar School in what seemed to be an affluent area just outside the suburbs of Preston. The organisation from Preston Harriers was spot on, with well organised parking around the village and marshals directing as each car park filled up. The grammar school HQ had all amenities signposted, goody bags handed out pre-race and different sponsors selling hot drinks, bacon and sausage butties, and Pete Bland Sports with a pop-up stall. My race build up thoughts were soon confirmed, and I seemed to be the sole TAC runner surrounded by club colours from Preston, Fylde and Blackburn, so it was back to my car for another 30 minutes of Absolute 90’s and Jason Manford. It really is a non-stop party in my car! Whilst the thought of staying in my car was appealing, yet another Plusnet commercial convinced me the race was more desirable. I know I’ve waffled on a bit, but that’s because the race was pretty standard stuff. I only realised after signing up that the race was 2 laps, and I wasn’t too happy about that. Starting from a residential lane behind the school, you ran for the best part of 3 miles through the semi-rural villages of Longton and Walmer Bridge as you headed south away from Preston. For PB chasers, the course was very flat with only 44m of elevation across 10 miles. The 3 mile mark, and therefore the 8 mile mark too, took the race onto the pavement by a bypass. One real downside to this race was this stretch was just shy of 2 miles and you had to do it twice. Traffic wasn’t an issue, but it seemed a shame that more country roads couldn’t be used. By the first time around I’d done as planned and settled into a nice rhythm and avoided the temptation to get over-excited and start chasing PBs. I was plodding along at a steady 5:10 per km. As expected, the first bypass section was a bit of slog. I knew by the time I’d done the first lap, I’d be much happier. Into the second lap I was still ambling along at 5:10, and started thinking more in terms of a one lap race, which despite being put off originally by 2 laps, probably helped. Km’s and miles kept ticking away, and the first half (of the 2nd lap) flew by as I notched off the different landmarks from the first lap. The bypass was always going to be a pain, but the steady pace I’d maintained and not overdoing it meant that my pace never subsided, and apart from the odd person it was me doing the passing, which is in my opinion is great motivation. On arriving back at Hutton with a kilometre to go, my legs were feeling heavy, but nothing compared to how I felt at Lancaster Half. As we left the bypass I put my foot down and finished with a last km split of 4:47; my fastest of the race. I passed about 10 people in this stretch which was nice, including making up about 20m on one guy in the last 100. Preston Harriers had a second goody bag waiting at the finish, which was good of them and certainly contributed to the value for money element. My unofficial time was 1:22:10, which I was pretty pleased with. I’ve run faster and would have been capable of more, but I wanted to enjoy the whole race and not fade badly as I had recently. 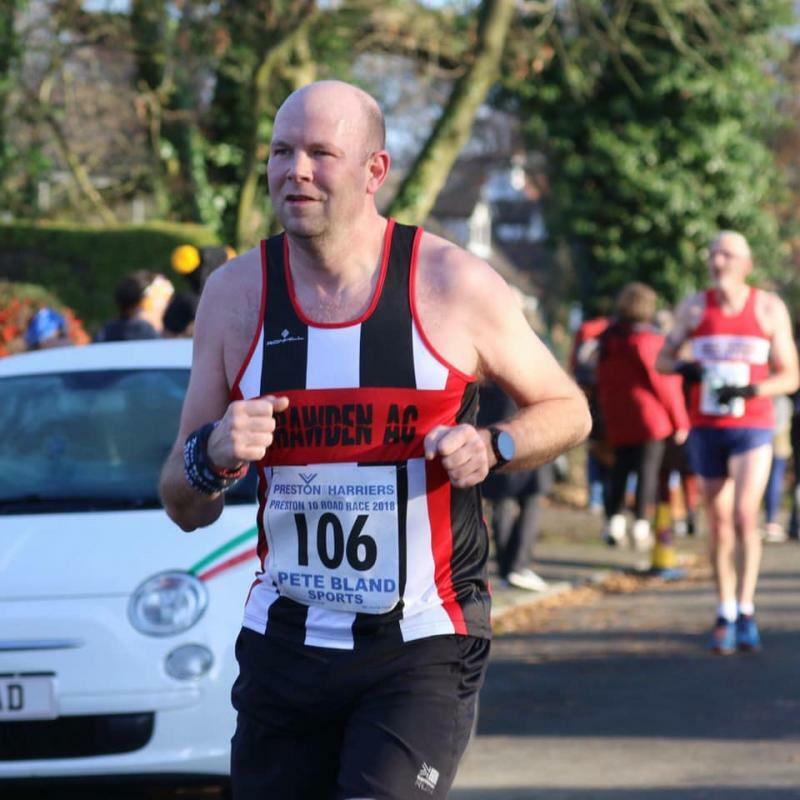 It wasn’t the best race in the world in terms of course, but Preston Harriers were very good hosts, and I would do it again.